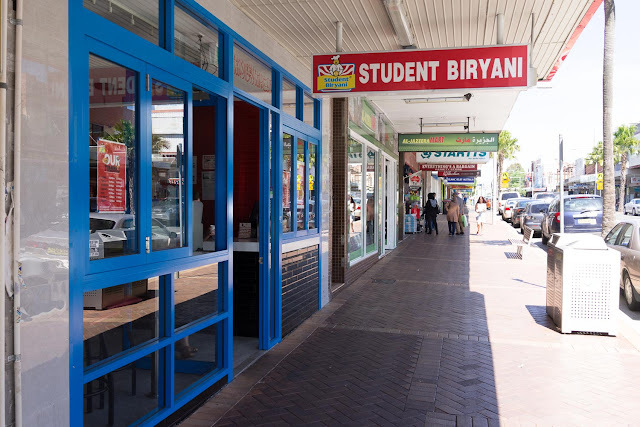 Student Biryani serves up heaped plates of spiced rice, curries and fried chicken for a bargain price. A+ grades all round. 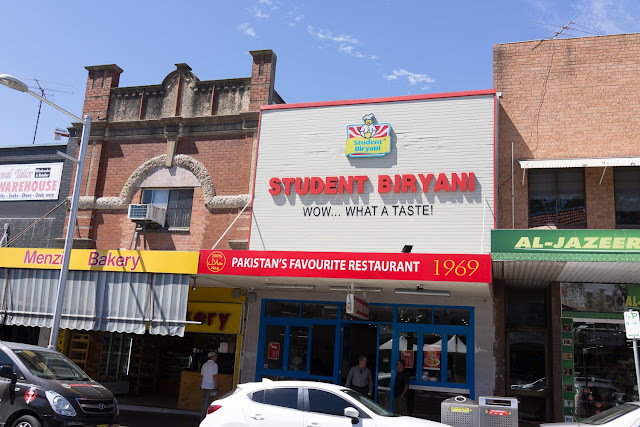 Student Biryani has been serving out plates of rive and curries since 1969 in Pakistan. It's been in Auburn a few years now, a couple of readers have suggested we go and we finally took their advice. Smart readers we have indeed. In an part of Auburn more defined by Turkish food, there is now a slow creep of Pakistani joints to investigate. Joy. Goat biryani - $12. Mr Shawn has a particular fetish for biryani and often finds it disappointing, but this is stellar - loose and lively long grain rice coated in a little ghee and that perfectly spiced zing we are always looking for. The goat is super slow-cooked-soft. Bloody ripper. Need more than one generous plate? 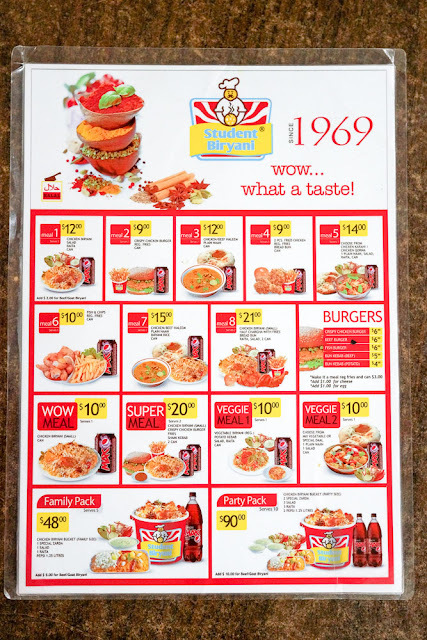 Why not try a bucket of biryani for $40. Yes, a whole KFC style bucket of spiced rice and meat, enough for the whole class. Meal #7 - $15. Beef (or chicken) haleem, biryani rice, naan bread and a can of drink. Bargain! To describe the consistency of haleem is the only time ever that you are legally allowed to use the word unctuous in food writing. 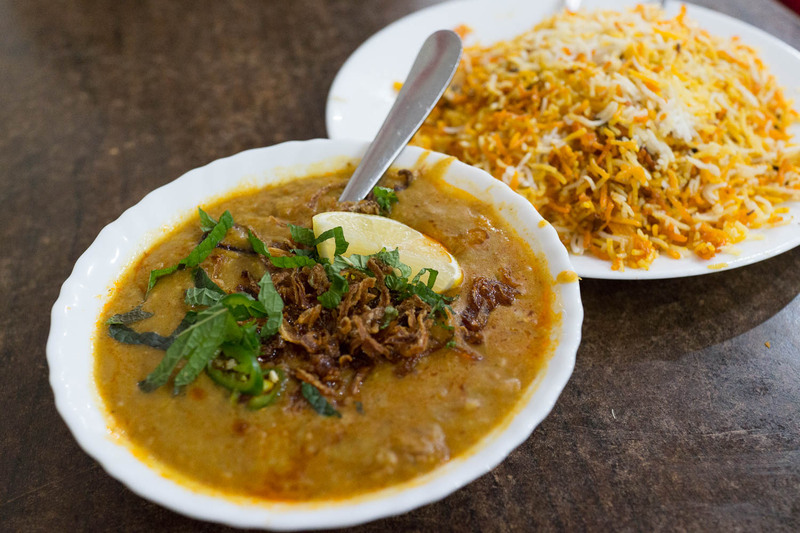 Haleem is a slow cooked mix of meat and beans, topped with fried onions (giant bags of fried onions also available on the front counter.) 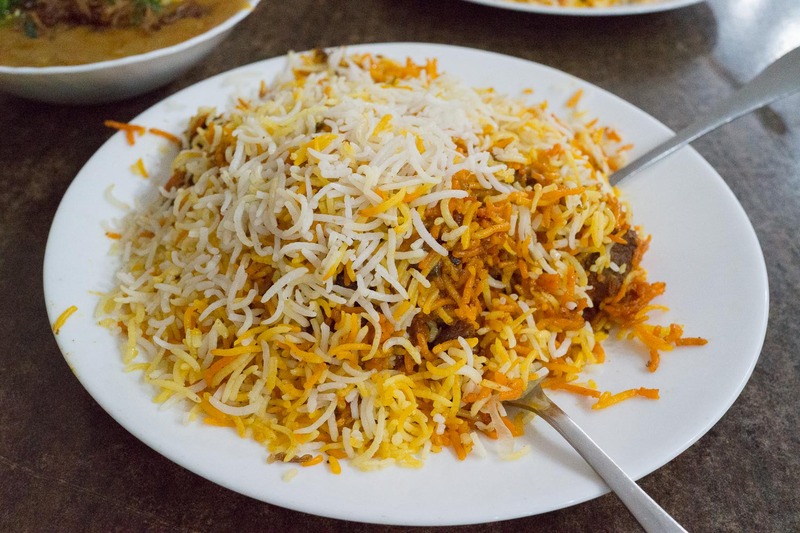 The biryani is meat-free and 90% as wonderful as the goat biryani. 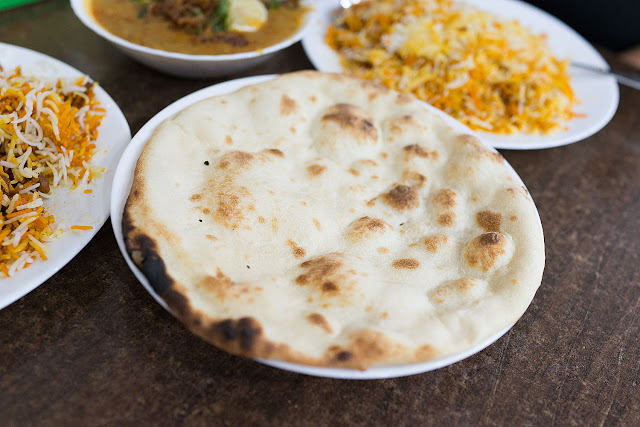 Naan bread comes with meal, get your own drinks from the fridge. Kulfi faluda - $5. 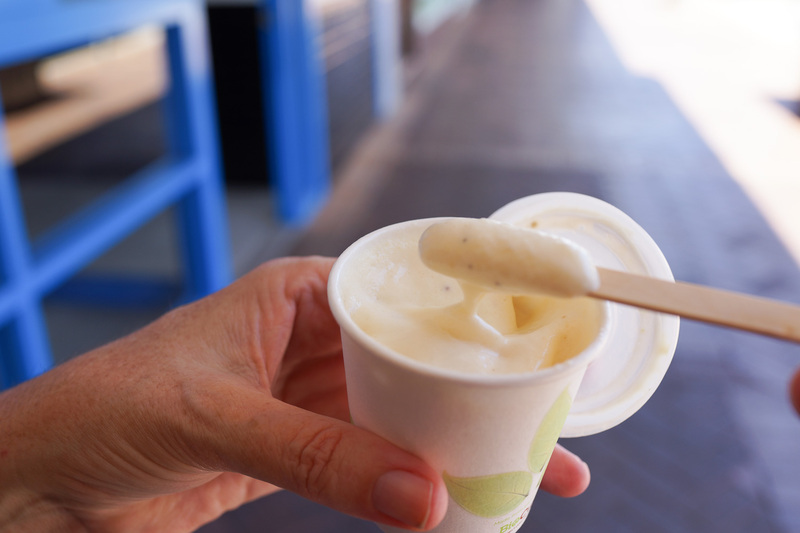 This tastes like Indian sweets with a texture of melting ice cream. O, boy. 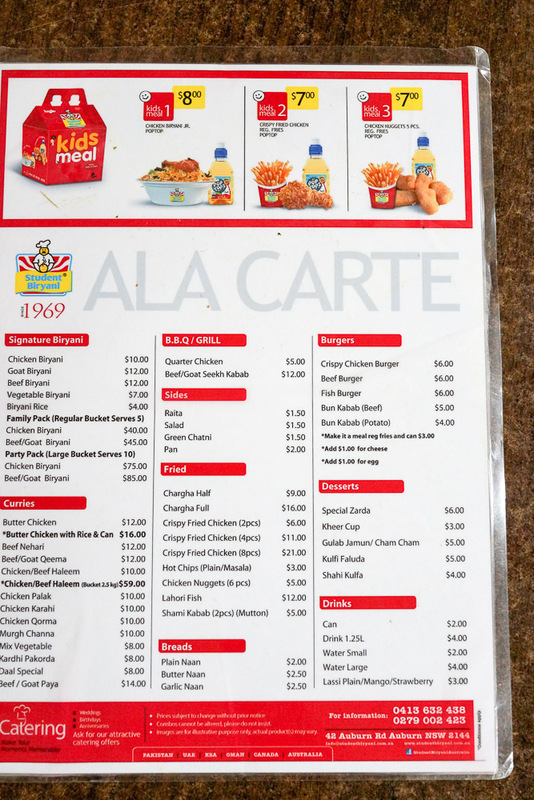 We're keen to head back to try the charga, Pakistani style fried chicken. And a bucket of biryani, of course. Student Biryani is at 42 Auburn Road, Auburn. I made the trip out to Student Biryani after reading your review. Ordered the haleem meal set. Delicious! So rich and tasty, it almost doesn't even need meat. It's up there with Faheem Enmore's haleem. Agree the vegetable biryani is also brilliant alone. Got a chicken biryani to go because I'm greedy. While the rice was stellar, I found the chicken somewhat dry and overcooked but it still had bags of flavour. Maybe goat is the way to go next time. Thanks for the inspiring review! Always glad to see someone enjoying a place as much as we did. Thanks for not only reading, but getting out there as well!